FC Mobile Portable Gaming System Plays NES Cartridges | OhGizmo! Got a stack of NES carts at home that you’ve been dying to play while traveling? I didn’t think so. Given the capabilities of the PSP and even the DS, I’m kind of surprised anyone would even want a portable way to play old NES carts when they can be so easily emulated. But the FC Mobile portable system does just that. It looks like a slightly fat, overly curvaceous version of the Game Boy Micro, but that’s mostly because of the slot on the back designed to accommodate NES cartridges. 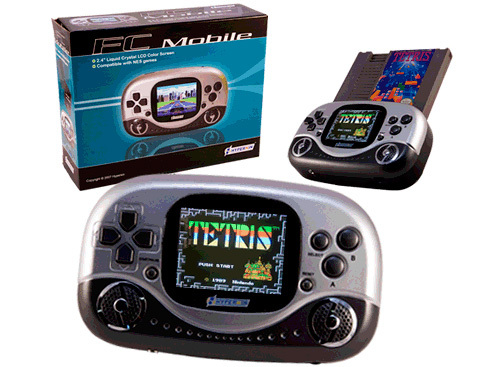 You can either play the games using the FC Mobile’s 2.4 inch LCD color screen, or use the included AV adapter cable to hook it up to a television and enjoy all that 8-bit goodness on your hi-def display. It’s powered by 3 AA batteries, comes in a red & white or silver & black color schemes and appears to only play North American NES games. Unfortunately the only place to pick one up right now is on eBay, where they range in price from around $30 to $60. I think that this game system is developed for true music fans of admirers still old systems of similar type.